The Clear Creek Group is fortunate to represent a fine collection of distinctive homes across the vast Jackson Hole valley. Cabins, condos, lodges, villas… however they differ in design and decor, they are all under the loving care of The Clear Creek Group. Each and every visitor to those homes is promised personal, professional service, and immaculate accommodations. The holiday season is a time that I find most humbling. So many come to The Clear Creek Group, and trust us with their festivities – it’s a dream come true for my partners and I as we truly love sharing the magic of a Jackson Hole winter with guests. Santa visits, sleigh rides, ski delivery, holiday musical shows, private chefs, dog sledding, teepee dinners… Jackson Hole is a kids-of-all-ages magical place. The Clear Creek Group was founded by three new but close friends eleven short years ago, who found a common bond in our vision. From the beginning, our guiding principle was to provide a level of service and home care that was not a part of the mainstream “vacation rental” service (even the words sound bad!). I am proud to say that we have succeeded in this endeavor. Another hope was that our business and professional lives would blur together, so to speak – and that happened right off the bat! We shared our friendship with homeowners and guests… and then they too became friends. We are lucky that the wonderful staff at TCCG feels the way we do about it, and happily steps in to make guests and homeowners feel a cherished part of the family. It’s always bittersweet when we have to say “so long” to friends who move on to other chapters in their lives, and sell their Jackson Hole homes. But when the new homeowner asks us to stay on, and continue to take care of the property… WOW! That is the absolute best affirmation of the work we are trying to do. Shooting Star Cabin 1 is one such property: a beloved family retreat that has become a treasured Jackson Hole refuge for new owners. If you are familiar with Shooting Star Cabin 1, you will recognize some of the early furnishings and delight, as we did, with the new touches! The new owners made the house their own, and, if possible, even better – how did they improve on perfection? Shooting Star is becoming a vibrant, lively neighborhood of homes, cabins, lodges and estates. Right next to Teton Village, it is a place where you can pull in to your driveway and offer a wave and a howdy to your neighbors, and maybe toast the day’s adventures with them under the stars. As always, the cabin is fully equipped and gorgeously furnished… and if anything is missing, just tell us. We’ll find what you need and get it right on over! I hope you enjoy the new photographs of Shooting Star Cabin 1 as much as we enjoyed creating them! Thank you for being a part of The Clear Creek Group – for reading our posts, following our Facebook, being our friend. Stop in and see us. The coffee is always fresh, and the smiles always welcoming. Hello all, and happy fall! You probably know by now that The Clear Creek Group takes fabulous care of houses as well as guests! And because of this, we have been able to blend our personal and professional lives to such an extent that our clients and Clear Creek Group guests often become our friends. We are very proud of this. The new Fish Creek Lodge 1 is a perfect example. We have grown to know and love the owners of this gorgeous property. As I photographed the house the other day with the team, I felt the care and attention the owners had put into it: (The incredible art! The collection of antique door knockers to welcome guests in the entry hall! The vintage Jackson Hole postcards!) and was overwhelmed with gratitude for their friendship – and for the confidence they have in our company and our caretaking department. Fish Creek Lodge 1 is great house, a house with heart, and it is ready for guests right now; a perfect home base for fall adventures. Autumn is a magnificent time to visit Jackson Hole, and this house, set at the base of the vast grounds of Shooting Star – is the perfect location to access the park, the wildlife, the town and the village. ing stone fireplace, equilibrium for the vertiginous view outside the floor-to-ceiling windows. Paragliders and bald eagles soar by, and the bright red tram lifts hikers and skiers to the summit of Rendezvous peak. 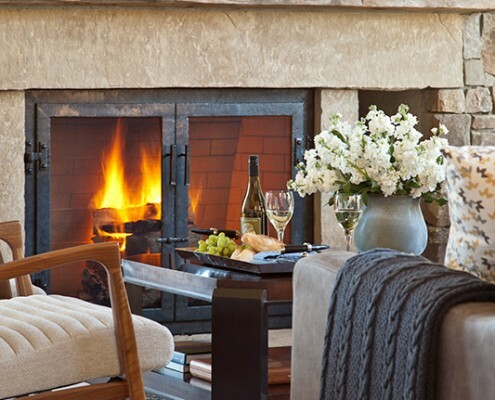 Ample soft seating invites family, friends or newlyweds (it’s the ultimate romantic getaway) together in a wide, fireside circle, or for meals at the long dining table.A TV above the hearth is cleverly concealed behind a rectangle of weathered boards. Just off the living room, a corridor leads to a carpeted guest bedroom and its private bathroom, as well as the laundry, a powder room and the garage. The kitchen, open to the great room, is a lovely mix of rustic details and gleaming modernity. Classic barn lights illuminate a marble countertop; old hand-hewn beams and stained wood cabinetry frame a fully-outfitted space with double ovens, refrigeration and microwave drawers, and a built-in wine cooler. Honestly, there is not a thing missing in this house. The owners seem to have anticipated every need and move of Clear Creek Group guests. Cooking in the kitchen will be a pleasure as every pot, pan, piece of equipment or table linens you could think of has been provided. And if they forgot it, we’ll get it for you! Doors flanking the living room fireplace open to the stone terrace and the sound of the merry little creek tumbling by. A covered seating area has a gas fireplace, and the outdoor dining table and a roomy hot tub wait right around the corner, with a magnificent backdrop of mountains, ski slopes and sky. The terraces are abundantly and comfortably furnished for maximum coziness, while marveling at the stunning views with breakfast coffee or evening cocktails. Upstairs at this luxury Jackson Hole vacation home are two bedrooms, with a den between them that can easily and comfortably convert to a third sleeping space. The master bedroom is over the garage, a big room with a gas fireplace and a seating area in front of a picture window. An airy paneled bathroom with double sinks, private water closet, glass walled shower and soaking tub stands beside a walk in closet. The second bedroom has two upholstered twin beds that can be converted to a king bed. A walk-through closet leads to the guest bath, with double sinks and a shower. Fish Creek Lodge 1 is truly in an ideal spot – right in the middle of Jackson Hole’s wild wonderland, a mile from Grand Teton National Park, and yet walking distance to the restaurants, shops and entertainment of downtown Jackson and Teton Village. In fact, the Shooting Star shuttle will pick you up at your door and take you right to the slopes. And here’s the kicker: The Clear Creek Group has another Shooting Star house right next door. Fish Creek Lodge 2! Different in design and feeling from Lodge 1, but wonderful in its own right. I will post about that one soon… but just imagine renting both homes, side by side, for an extended family reunion, a getaway with lots of friends, or a corporate retreat. I mean really, can you beat that? P.S. I can’t forget to thank Gordon Gregory for this stunning photography-Thanks, Gordon!